With the opportunity to write, direct, animate, and edit their own 3D animated short films during the school year, the 12-Weekend 3D Animation Camp for teens is a creative experience like no other. At the New York Film Academy, aspiring animators learn the vital skills and tools of their craft hands-on. Over the course of 12 weekends, students review the history of animation and the traditional animation pipeline, also learning the foundational techniques used in modeling, texturing, and animating both characters and environments. Classes focus on storytelling through the audio-visual medium of 3D animation, using industry-standard software and latest-generation Apple computers. Each four-hour class helps students design, storyboard, model, and animate a small scene of their own design. 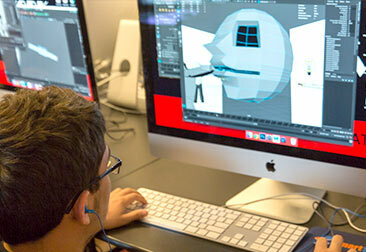 The 12-weekend 3D animation program is designed for teens with little or no experience. As 3D animation requires a great degree of focus and discipline, a studio art background or digital illustration experience is helpful. In each week of the program, teens will explore a new topic within 3D animation, building new skills and creating original work. Week 1: History of Animation: Students view excerpts of films throughout the history of animation. Week 2: Intro to 3D Design: Using an easy-to-use 3D program called Magic Voxel, students create a 3D environment and character, upon which they will base their projects for the rest of the course. Week 3: Storyboarding: Students are introduced to Adobe Photoshop, and make a 4- to 6-panel storyboard. Week 4: Intro to Maya: Students start their journey with Maya by getting an introduction to its complex interface, using this to create a bouncing ball animation. Week 5: Modeling & Texturing: Students have access to an array of pre-built character models, which they are encouraged to customize through Texturing to customize for their scenes. Week 6: Texturing, Part 2: Students continue to customize their models, using both Photoshop and Maya. Week 7: Walk Cycles: Students learn to animate their customized models in Maya. Week 8: Environment Modeling: Students import and revise their Magic Voxel scenes using Maya, to create the background and objects in which their model will walk. Week 9: Environment Modeling, Part 2: Students continue to develop their 3D environments in Maya. Week 10: Character Animation: Students place their character models into the 3D environment, and begin to build their scene. 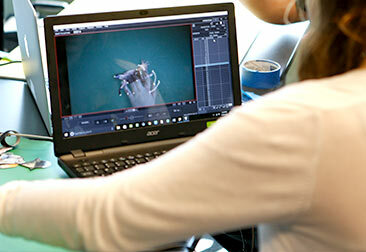 Week 11: Finishing Touches & Rendering: Students complete their animated scenes, and begin to prepare their short films. Week 12: Final Rendering & Showcase: Students finish their short films and showcase them in a screening for friends and family.